A close game against perennial Class S power Bloomfield last season set the stage for what turned out to be a nice comeback year for the Plainville High football team. 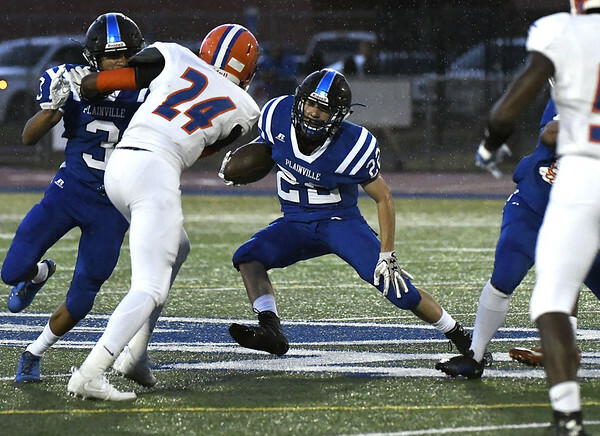 Both teams look to come back even stronger this year, after Bloomfield went 8-2 and just missed out on a playoff spot and Plainville won four games in a row en route to a 5-5 season. Plainville head coach Tim Shea knows what it means to have Bloomfield on the schedule. As a freshman, Daron Bryden played in all 10 games for the Warhawks, throwing for 1,676 yards on 115-for-171 passing, with 19 touchdowns and just eight interceptions. Returning as a sophomore, he’ll have plenty of other, older veterans to help him on offense. Among them is senior running back Ky’Juon Butler, who ran 199 times for 1,714 yards and 16 touchdowns last season. He also caught 10 passes for 99 yards, including another touchdown. Among the other key returnees for Bloomfield is junior receiver Anthony Simpson, who led the team with 646 yards and eight touchdowns on 40 catches last season. For their part, the Blue Devils are focusing on trying to do what Bloomfield failed to do last year - make the Class S state playoffs. “We’ve got to take it one day at a time, one game at a time, one week at a time,” Shea said. Ever since last year’s unfortunate loss to Farmington on Thanksgiving Day broke Plainville’s four-game winning streak, the Blue Devils have been working to take their progress a step further this year. With both teams looking to take a step forward from last year, there’s no doubt that this year’s opening matchup for both will be a thriller. Posted in New Britain Herald, Plainville on Thursday, 6 September 2018 20:50. Updated: Thursday, 6 September 2018 20:52.